As cable prices continue to rise with the addition of HD and increased channel selection, consumers are left wondering if there is an alternative to the high cost of cable. While the selection of alternatives is increasing we are going to focus on and review one particular option, the Roku XDS box (equal to Roku 2 XS model). The Roku box is a media streaming device for use on your existing TV. The Roku streams media from the internet via Roku channels which are very similar to apps for different providers such as Netflix, NHL, Pandora and so on. The Roku can also display your own personal media through a USB connection. In a nutshell, the Roku uses your existing high speed internet connection to stream media to your television. The connection can be hard wired via ethernet cable or wireless through your wireless router. Since Roku explains the setup and connection process more than adequately, we will refer inquiries about how it works to the Roku website: Roku: How It Works. The Roku measures less than 5 inches in length and width and under 1.5 inches in height. Frankly its tiny, especially when compared to the typical satellite/cable boxes or receivers. With such small dimensions, the Roku can fit nearly anywhere inconspicuously which leaves the TV the only focal point in your media viewing area. Setup for the Roku is nearly dummy proof. You simply connect it to your TV and plug it in. The Roku comes packaged with an HDMI cable for highest quality viewing experience, so no extra cords or cables to buy. Once everything is connected, the Roku goes through its initial setup stages, one of which is to register the product online. While registering online is nothing new to most of us, this is arguably the most cumbersome part of the setup simply because you need to copy the code displayed by Roku on your TV and enter into their online webpage. The process is not difficult by any means but it will require you to be online and setup the Roku simultaneously. One last item for the Roku during the setup stage is to download any software updates for the Roku box. That can take some time depending on how large the updates are but relatively speaking should take 10-20 minutes on a fast ethernet connection. The Roku remote control is proportionally as small as the box itself. There are several buttons but for the most part it is a simple device. The remote is not a universal remote and at this time we don’t know of any universal remotes that will operate the Roku, so you’ll need to use that remote exclusively for viewing on the Roku. EDIT: The Logitech Harmony works with Roku. Thanks to several of our readers for the information. We picked out two Logitech models if you’re looking to make a purchase, the Logitech Harmony 300 and the Logitech Harmony 650. There is also a Roku remote control app for your smartphones. Search your respective app stores for ‘Roku’ to find the app. Once the Roku is setup, you are ready to personalize the box to your viewing interests. The onscreen menu is very simple. 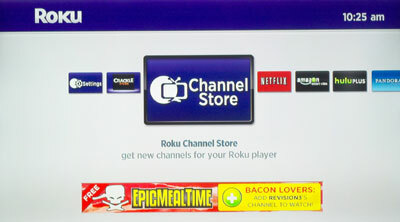 The Roku channels are lined horizontally across the screen and navigation is a simple left or right click of the remote. Initially, the ‘Channel Store’ is where to start. From there you can select the channels you want to add to your Roku box. Popular choices include the Netflix, NHL, Hulu Plus, Pandora and Roku Newscaster channels. Any channel that provides a service for a fee, such as Netflix where you pay a monthly fee will require a registration of your Roku box with that service. Registration takes place online and before each of those channels is accessed for the first time, a code will be given to you by the Roku for entering online. 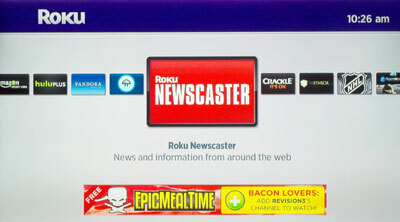 For quick viewing at the start, just add the Roku Newscaster channel, since that channel does not require a code, and view some of the news programs available through the Roku. Using the Roku becomes second nature after a very short time. To start, you’ll need to select a channel from the home menu to view programs. Once a channel is selected, the channel interface will guide you through using the service. 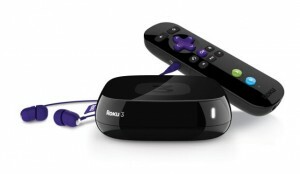 The Roku provides all the tools necessary to stream the content from the channels but ultimately the navigation and viewable content is determined by the channel provider. See Part II for more details on channel content and providers. We purchased two XDS units and tested them from different locations and distances to the wireless router. The reception is very similar to that of a laptop. The range will obviously degrade over greater distances and through multiple obstructions but all in all holds signal strength very well. The interface is simple, lightweight and better than the interface we’ve seen on other devices. Particularly speaking, some of the Sony blu-ray interfaces are atrocious compared to the Roku. The Roku interface is quick, mainly because it is so simple but the reaction time of channels via the Roku is very fast with little delay between selection and access. The channels themselves have been developed intelligently to work well with the Roku and function with ease of use in mind. More on channels in Part II. The on screen interface of the Roku is lightweight and makes viewing convenient. The remote is small and uncomplicated, making for an easy to learn control system and great usability. The Roku comes packaged with an HDMI cable, a significant plus for viewing. The remote control comes with batteries, which is a nice touch. The batteries last for quite a while and we have yet to change them in either device since their usage began 3 months ago. The Roku’s small size is ideal for those who want to hide away all the gadgets associated with the TV and just view the TV. The wireless setup is simple as long as you know your wireless password and the range is within acceptable limits. The biggest con is that you don’t watch television shows or broadcasts on their scheduled air date (sports are accessible live). Having said that, it can also be seen as the biggest pro as it allows you to watch the shows and programs you enjoy on your own schedule. We noticed that, occasionally, after a software update the Roku would freeze and need to be reset. Not a huge inconvenience as reseting it means unplugging the box and replugging it in. Not altogether different from when a DVR or receiver acts up. If you don’t have a wireless network then you’ll need to use a cable which is likely to be inconvenient. If you are interested in cutting the cable cord and aren’t concerned about seeing shows on their original air date, then the Roku is likely to fit your lifestyle. We found the Roku to be exactly as advertised. It delivers the content as expected and functions as good if not better than standard receivers or cable boxes. We reviewed their most expensive unit (XDS) at a cost of $99.99 USD and find that to be a bargain. The lesser versions at $79.99 and $59.99 are a steal. The XDS is currently available at the Roku website, at BJ’s and at Amazon.com. Since writing this review Roku has updated their models to the Roku 2. The XDS we reviewed is comparable to the new Roku XS version shown below. Be sure to check out Part II of our Roku review, where we analyze the content/channel providers and give you the lowdown on which are making the grade and which need to step up. Here’s a sneak peak, Netflix and Hulu Plus are battling for position in online viewing and both are available on Roku but one is clearly outshining the other. Have you cut the cable cord? Do you use the Roku or another media streaming device? Have questions on the Roku that we didn’t answer? Let us know in the comments section! @Bob – Roku is a separate entity and will function with or without cable, over the air satellites, etc. Can I watch local channels like HDTV channels over the air (like METV, Cozi) and still have Roku? @Gideon – The Roku needs internet access to display content on the TV. The Roku has built-in WiFi capability, so just connect the Roku to your home wireless network. The other option is to run an ethernet cable from your modem/router to the Roku. Good luck! @Pamela – The Roku uses an internet connection to deliver programming to your television. If your area is covered by Comcast, then they likely have the monopoly on both cable and internet. You can ditch the cable portion of your Comcast bill, but will still need internet access in order to use the Roku for program viewing. If Comcast controls your internet service, then you will still need to pay them for that portion of your service. A quick check of Comcast pricing in the Portland, Oregon area shows Xfinity Internet service introductory rates as low as $29.99/month. If you intend on using the Roku, then I recommend calling Comcast and explain that you want to retain or add internet service, but cancel your cable service. See how the Roku works out for a month or two to see if it fits yours and your mother’s needs. I am reading alot about this online and have some questions. Our apartment complex in Portland Oregon has cut our Comcast cable and told us it would be very expensive to keep. 85% of our complex is elderly and low income apartments and when they told us the other day that we would have to pay way more for our cable my mom and I wrote the management company and complained and they did not even get back to us. When my mom signed her lease the other day they said since we were NOT property owners that no matter how much Comcast cost and it was alot more we had to pay it. My mom gets only $1000 month SS and has to pay all her bills on that and all I get is $950 month disability. Again the management does not give a damn and are greedy jerks. My brother bought her a ROKU for her and my friend is going to put it in and have read all over the internet about it. How is this unit going to help people (my mom who is poor) forced from apartment managers to disconnect cable because of greedy apartment owners who could care less about the poor? She cannot pay this new cable price and neither can I for that matter. I do not understand how the ROKU is going to help her? Cable companies have a law called MUST Carry where they have to carry 13 channels and not charge the public for and those channels come out of the air. This complex is not going to do that and is charging lots of money for XFINITY cable. I thought MUST CARRY meant that they had to provide this antenna service at an affordable price. Please help my mom and me from this greedy management company. @Ken – Good question. Unfortunately, there isn’t a way to view websites through the Roku. Whether or not that’s a feature that could be incorporated into the device down the road is up to the folks at Roku. It’s a hard thing to watch content for free as providers and owners are locking their stuff up pretty tight. Some going to extremes with requiring users to have a cable account in order to watch shows online (ESPN & TNT come to mind). I enjoy watching network shows that I missed, on their websites. Is there a way I can use Roku to do this, other than incorporating some sort of pay service like Hulu Plus? @Ken – You can move the Roku wherever you want. You’ll of course need to reconfigure it’s wireless settings for each location, but otherwise it will work just fine. As far as International (outside US) content, there is a good number of channels. Roku recently struck a deal with Dish Network to handle all their international content so it’s still unclear what that means in terms of actual channels. Whether a content provider decides to broadcast their content through the Roku is entirely up to them, not Roku. To be specific, for Canada, in order for CBC, TSN or any other Canadian network to be available on Roku, then they need to make their content available through the Roku. Again, being specific, CBC & TSN are not available on Roku, although there are a number of Canadian television shows available via Netflix (Heartland for example) which is available Roku. I live in Canada but I spend most of the winter months with family members in Florida. 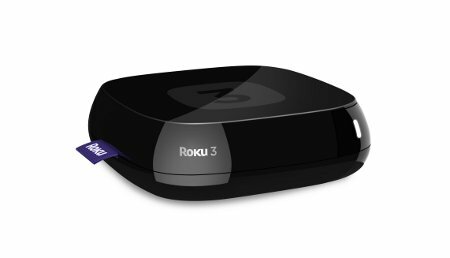 If I buy Roku and use it in Canada, can I disconnect it and bring it with me to use in Florida? Is there any “Canadian content” or does everything come from the US? I’ll try to clear things up if I can. First, don’t think of Roku as cable, think of it as a media gathering box. It pulls content from the internet and displays it on your TV. So to answer the question of watching shows, yes – you watch them after they air IF content providers such as Hulu Plus offer them via streaming device (Roku). Hulu Plus is your best option to see current TV quickly, but broadcasters limit what and how much they can show. Finally, your question of, “..do I still need comcast?” If you’re a BIG tv watcher, then Roku isn’t for you. Roku is more for the person who needs/wants to watch TV on their schedule and doesn’t mind catching up on full season shows on Netflix or Amazon. The cable companies are buying up content providers and adding paywalls to online streaming which means it is difficult to navigate all these options, so I understand your confusion. As an example, you couldn’t see the Olympics without cable. Please be patient with me because i am “geek” illiterate. I am trying to understand how the Roku works. I currently have comcast with expanded basic, two dvr’s, a modem and internet. I need to cut this bill out if I can. If I buy a Roku do I still need comcast? Can I watch shows only after they have aired or do I keep comcast for just the basic channels and the wireless? If I have two TV’s do I need two Roku’s? HELP? This web site is really a walk-through for all of the info you wanted about this and didn’t know who to ask. look for it here, and you’ll definitely discover it. We’re going to cover some content in Part II, including some of the items you brought up. Thanks for the comments Adam! Thanks for sharing your experience Gil! Logitech Harmony One does pretty well, in my experience. The lag is much greater than using the Roku remote, itself, but it’s great to have all of my devices unified on the one remote. We’re missing Baseball and ESPN the most, here. In addition, Hulu Plus doesn’t include all the series we like to watch…have to watch them “online only.” Otherwise, it’s doing just fine, coupled with our OTA Antenna stations. The Logitech Harmony series of remotes operates the Roku player like a charm.